In September 2018, we had the opportunity to visit the island of Samosir, located within the caldera of Lake Toba in Sumatra, Indonesia. We were invited by GFNY Indonesia to take part in the weekend race and experience what this beautiful island had to offer. Nadiah would be covering the race as media representing Cycling Plus Malaysia, along with her colleague Treas. The race itself was held on a Sunday, so we hatched a plan to fly in a few days before to do a bit of exploration before race day to enjoy the scenery. Lake Toba is the largest natural lake in Indonesia and the largest volcanic lake in the world, occupying the caldera of a supervolcano. The lake is about 100 kilometers (62 miles) long, 30 kilometers (19 miles) wide, and has a depth of up to 505 meters (1,657 feet) deep. The surface elevation of the lake itself is around 900 meters (2,953 feet) above sea level with a much cooler climate compared to other parts of Sumatra. The Toba eruption (also known as the Toba Catastrophic Event in geological circles) that formed Lake Toba occurred around 75,000 years ago. It was the last in a series of at least four caldera-forming eruptions within the same location, with earlier calderas having formed around 790,000 years ago. The final eruption had an estimated VEI=8, making it the largest-known explosive volcanic eruption within the last 25 million years. The journey to Samosir was an arduous one that required multiple modes of transportation. At the time, the only international airport that we could get to from Kuala Lumpur was located in Medan. Starting in October however, AirAsia has started offering direct flights to Samosir itself landing at the Silangit International Airport, so perhaps we may try that in the future. The Kualanamu International Airport in Medan is located roughly 250km away from the island of Samosir, which translated to a 5-hour bus ride and a 1-hour ferry transfer from Simalungun at the northeast side of the lake. Here’s a Google Maps link to the ferry docking port area. Leica Malaysia was also extremely generous in providing us with a loaner camera for the trip - the Leica D-Lux Type 109. With the fairly lightweight camera slung across my back, we used it almost exclusively to document our travels in Samosir. 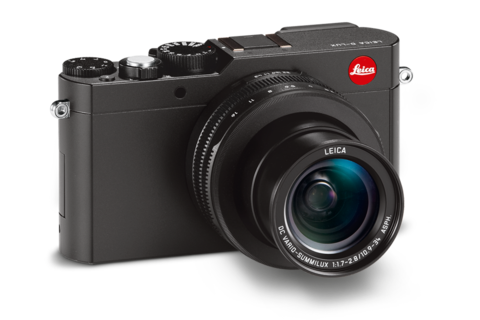 Note: this particular model has been discontinued, and a new one has been launched to replace it - the Leica D-Lux 7. Luckily, we had the kind folks of GFNY Indonesia assisting us with all the logistical details. As it was a big race, there were quite a lot of international cyclists coming in for the event. Our bike bags were taken cared of separately through another logistics channel, so we only had to worry about our backpacks to get there. The Gran Fondo route would circumvent the entire island of Samosir with a distance of 152km, along with an impressive 2,000m of climbing. The Medio Fondo route would take place along the northern part of the island, covering a distance of 103km with more than 800m of climbing. I chose to go with the second option as I wanted to complete the ride within qualifying time and also the chance to snap some photos along the route. Amongst the three of us, I would be the only one to take part in the race itself to get a feel for it, while Nadiah and Treas would be covering the event on motorized vehicles. At the end of the race, I managed to finish at number 23 out of 111 contestants for the Medio Fondo (view the official results). Before the day of the race, we wanted to enjoy the natural landscapes of Samosir at a relaxed pace, and the three of us decided to follow the general Medio Fondo route which just happened to pass through a few notable places that are worth visiting. The Batak people are the inhabitants of Lake Toba, and their culture is intertwined with Lake Toba and the sacred island of Samosir that lies within it. The Batak homes of Toba are laid out side by side with their front gables facing the street. Traditionally, each house would have a complementary rice barn granary on the opposite side, so you could imagine a street with a row of houses and a row of matching granaries. The street itself is known as alaman and is a communal area for work, agriculture and play. The large steeply-pitched saddleback roof is the signature structure of the house. The roofs are traditionally thatched, and with no internal roof trusses; they provide a large internal space for large families. Sharply projected triangular eaves and gables overlap all around the substructure. The front gable extends further than the rear gable and is finely carved and painted with motifs of suns, starts, cockerels, and geometric motifs in red, white, and black. As we cycled along the edge of Samosir island, we still saw many of these traditional houses. Some have been well preserved, but many are falling into a state of disrepair and abandon as families have started moving to more modern concrete homes. Not too far from where we were staying is Huta Siallagan, a sublime but historically significant location. In the local language, Huta can be translated as “village” – Huta Siallagan means the Village of Siallagan. The word also can be used to identify the family or clan that stays there, which in this case is the Clan of Siallagan - descendents of King Naimbaton who came from the line of King Isumbaon, the second son of the first Batak King. From a historical point of view, Huta Siallagan village was founded during the reign of King Laga Siallagan who was the first ruler, then further expanded during the time of his heir, King Hendrik Siallagan, along with the descendants of King Ompu Batu Ginjang Siallagan. A number of descendants of King Siallagan still reside here today, and the tombs of their ancestors can be found nearby. What makes Huta Siallagan special are the interesting stone artifacts that reside there. Large stones have been carved into chairs encircling a stone table – imagine a royal round table all made and carved from stone! Their round table is called Batu Persandingan, and two sets were created in different parts of the village. The first is located at the center of the village under the sacred Hariara tree where official meetings with the king and clan elders took place, and the second is located further back in the village with the addition of a long stone table where executions took place. These relics are believed to be over 200 years old. If you’d like to read up more about this place, you can find more details on this website. The terrain of the island that is closest to the edge of the lake is mostly made up of rolling meadows, buffs overlooking the lake and beaches. The cycling here is fairly relaxed until you get to the much steeper climbs that bring you an additional 200+ meters of elevation above the lake itself. Where there are plains and meadows, you will see agricultural land growing a few types of staple crops, predominantly rice and corn. Most people associate beaches with the ocean, but the size of Lake Toba also provides a few of its own beach heads to stop by and relax. We made some stops to replenish with fresh coconut water at a few beach spots. There are plenty of places to stay within the island itself, but the majority of the hotels were located on the eastern part of the island closest to the ferry docks in Ambarita. This was also the more touristy part of the island where the majority of restaurants and inns were located. We stayed in one of the simpler hotels in the area that had a direct view of the beautiful lakeside. 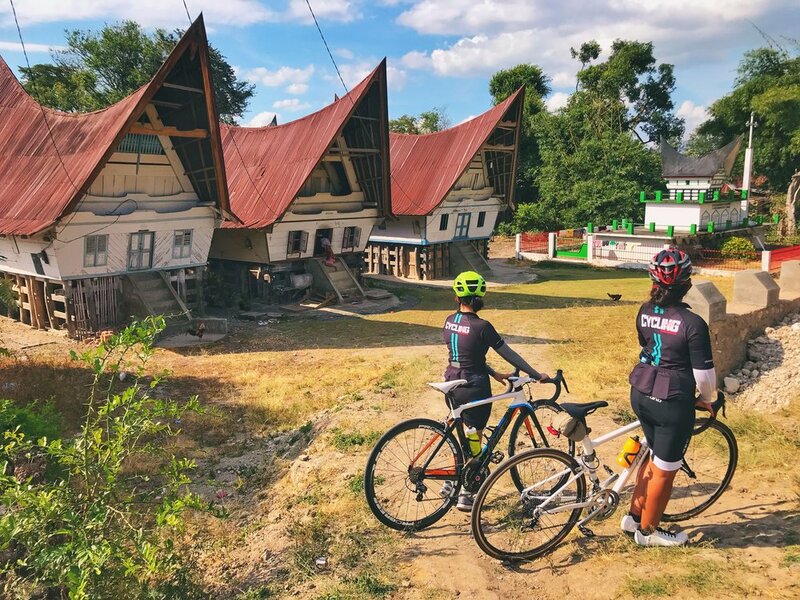 The official hotel for the event was Samosir Cottages, which was where the majority of cyclists were staying at and seemed to be the largest resort in the area. Google map link. We stayed at the neighboring Anju Cottage, which was literally next door. There were a dozen other places scattered around the general vicinity, so if you were to come here on your own, finding a place to stay isn’t that difficult. The route that I tracked on Strava was the official GFNY Samosir Medio Fondo route. This route takes you from the general starting point around Ambarita where the inns and hotels are located, and then brings you to the extremely scenic climbs by the mountain pass near Singkam that commands a spectacular view of Lake Toba and loops back. The climbs starting after the 45km checkpoint can be quite challenging with steep sections that have 16% gradients, but if you are not in a race (or not in a hurry), it can be completed by most intermediate cyclists in a day. The views alone make it worthwhile, especially around the peak of the mountain loop near Singkam. If you are looking for more of a challenge and have extra time to spare, the full round-island route gives you 152km of cycling paradise and an even more challenging climb on the eastern part of the island! Overall, all three of us enjoyed cycling in Samosir greatly, and wished that we could have had more time to ride there. It was a short work trip after all, and there were some unforeseen issues upon arrival. First of all, we had trouble locating our bikes that were sent to the wrong room, and the day before leaving we were forced to pack up early so that the logistics crew could get everyone’s bikes to the mainland together safely. However, the day we did spend cycling was a joy indeed. With its cool weather, spectacular views and very little traffic, Samosir is definitely a cycling paradise - provided you can bear with the journey to get there. We’d definitely love to be back on our own time to explore the entire island.